Bentley is bound to sell to wealthy customers around the world – here in the United States, back home in the UK and Europe, and as far away as China. But if there was any doubt for which market the British automaker really built its first crossover, this latest special edition ought to put the matter to rest. Specially crafted by Bentley's Mulliner personalization division, the Pearl of the Gulf edition is "inspired by the Arabian Gulf” – otherwise known as the Persian Gulf, the body of water along which all those oil-rich Middle Eastern countries are lined. Setting apart the special edition are unique touches like Dark Fiddleback Eucalyptus marquetry depicting a classic pearl-diving boat, complementing the two-tone Linen and Brunel leather interior with Camel and Brunel stitching, gold-thread embroidery, and matching lambswool carpeting. The dashboard is adorned with a mother-of-pearl Breitling clock. And it even has a fingerprint-activated safe on board in which owners can secure the pearls for which the region is known (aside from its petroleum) and which inspired the special luxury crossover – or, you know, what ever other valuables its affluent occupants might have to secure. 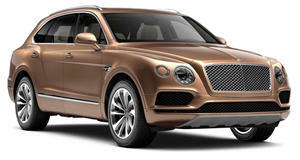 Mulliner will only make five examples, said to have been personally commissioned by a single Middle Eastern customer. Each is based on the W12-powered model, which (in "base” form) produces 600 horsepower and 664 lb-ft of torque, or 626 hp (and the same amount of torque) in . No , , or here, since we'd wager the client has access to as much gasoline as he (or less likely she) could possibly need, and the revenues there from to have Bentley make up this special series to their own specifications.